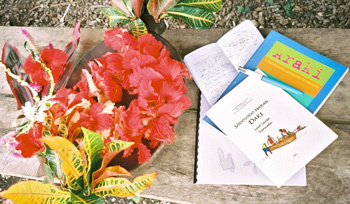 Welcome to the online lexicon of Araki – an Oceanic language spoken in the small island of the same name, close to Espiritu Santo island, in northern Vanuatu. Araki is a highly endangered language: it is currently spoken by only 8 speakers today, being replaced by the neighbouring language of Tangoa. In 2000, I was contacted by Hannah Vari-Bogiri, a linguist working at the University of the South Pacific, in Port Vila. Being herself of Araki descent, she was planning to help the community of her island revitalise their language. She had heard of my little fieldwork experience on Araki, and encouraged me to publish my notes as soon as possible. This led to a descriptive book on this language, called: Araki: A disappearing language of Vanuatu, published in 2002 by Pacific Linguistics. This book included a sociolinguistic sketch, a grammar with bilingual texts, as well as a bilingual Araki-English lexicon. have found their way into the Wikipedia page on Araki…). Right after this publication, I also prepared a small collection of traditional stories, called Sorosoro m̈ar̄an Raki ‘Stories from Araki’. These events increased the community's awareness of their ancestral language's endangerment. A new language committee, set up by Hannah Vari-Bogiri to promote vernacular literacy, recently came up with a fine-tuned orthography for the language. Compared with the one I had initially proposed in my first publications, this involves a change in spelling for four consonants, whose transcription indeed varies among Vanuatu languages. Thus the four phonemes /ʧ/, /ŋ/, /ɾ/, /r/, which in my earlier works were spelled respectively |c, g, d, r|, will now be represented as |j, ng, r, r̄|. Vowels are more simple: i, e, a, o, u. → download it from my "Literacy materials" section. I have prepared a revised edition of the lexicon part of my Araki monography. This has become an online trilingual (Araki-English-French) dictionary. → You can have direct access to the lexicon. → You can check essential background information on that online edition.